02-01-2016 silverbow Box Text The water is rising, there are 9 doors and time is running out... You have only 9 hours before Junpei and his 8 fellow abductees drown. Numerology, music composition and logic puzzles are just a few of the 30+ obstacles that stand in the way of their freedom. You'll have to use everything in your environment to get out! Solve the mysteries that cloud your companions' pasts, and unveil a disturbing future. 01-28-2015 desocietas Box Text The water is rising, there are 9 doors and time is running out... You have only 9 hours before Junpei and his 8 fellow abductees drown. Numerology, music-composition and logic puzzles are just a few of the 30+ obstacles that stand in the way of their freedom. You'll have to use everything in your environment to get out! Solve the mysteries the cloud your companions' pasts, and unveil a disturbing future. 08-13-2014 pizzasafari Box Text The Water Is Rising, There are 9 Doors - and Time Is Running Out... You have only 9 hours before Junpei and his 8 fellow abductees drown. Numerology, music-composition and logic puzzles are just a few of the 30+ obstacles that stand in the way of their freedom. You'll have to use everything in your environment to GET OUT! 05-16-2012 disgaeniac Description * Solve the Mysteries That Cloud Your Companion's Pasts...And Unveil A Disturbing Future. 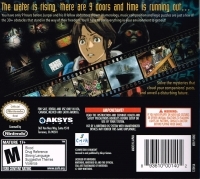 05-16-2012 disgaeniac Box Text The Water Is Rising, There are 9 Doors - and Time Is Running Out... You have only 9 hours before Junpei and his 8 fellow abductees drown. Numerology, music-composition and logic puzzles are just a few of the 30+ obstacles that stand in the way of their freedom. You'll have to use everything in your environment to GET OUT! 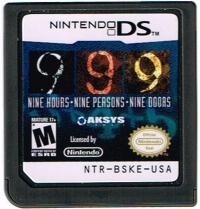 This is a list of VGCollect users who have 999: Nine Hours, Nine Persons, Nine Doors in their Collection. 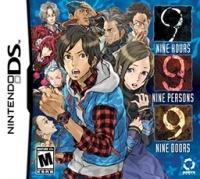 This is a list of VGCollect users who have 999: Nine Hours, Nine Persons, Nine Doors in their Sell List. This is a list of VGCollect users who have 999: Nine Hours, Nine Persons, Nine Doors in their Wish List.